Who was Smith – the mystery designer of ‘Belvedere’? ‘Belvedere’ – one of the more colourful patterns in our collection – has an intriguing, if mysterious, back-story. As every student of wallpaper and revolution knows, one of the first acts of mob violence in Paris in 1789 was the sacking of the Royal Wallpaper Manufactory of Jean Reveillon. 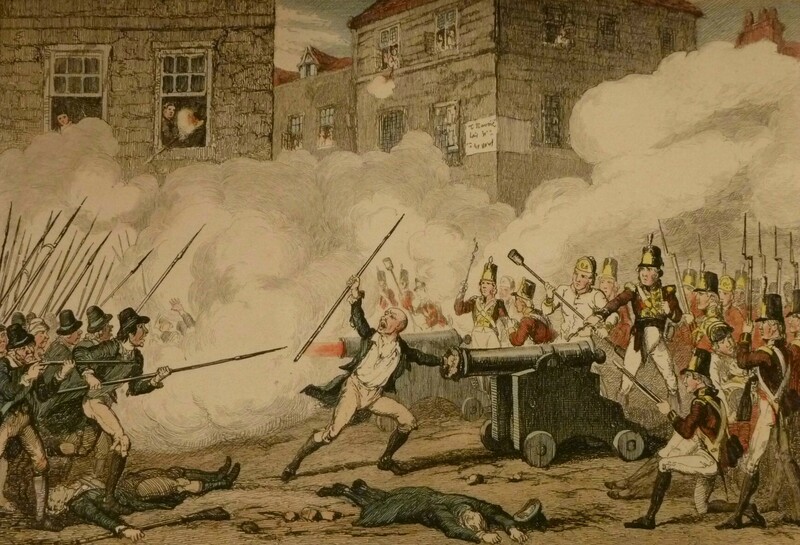 In the wake of the French revolution, Ireland saw its own episodes of armed rebellion in 1798 and 1803 – although during both of these outbreaks Dublin’s industrious paper-stainers seem to have kept their heads safely down. The United Irish cause attracted artisans and merchants from many of the textile trades, however , but as the movement went underground and headed towards physical force its wealthier, merchant-class adherents mostly fell away. One of the few who didn’t was James Smith (or Smyth) , a calico printer in Leixlip, and associate of the leading United Irishmen of north Kildare, including Lord Edward Fitzgerald. Smith played an active role in the 53-day military campaign in Kildare in 1798, before surrendering with the other United Irish forces at Sallins in July. 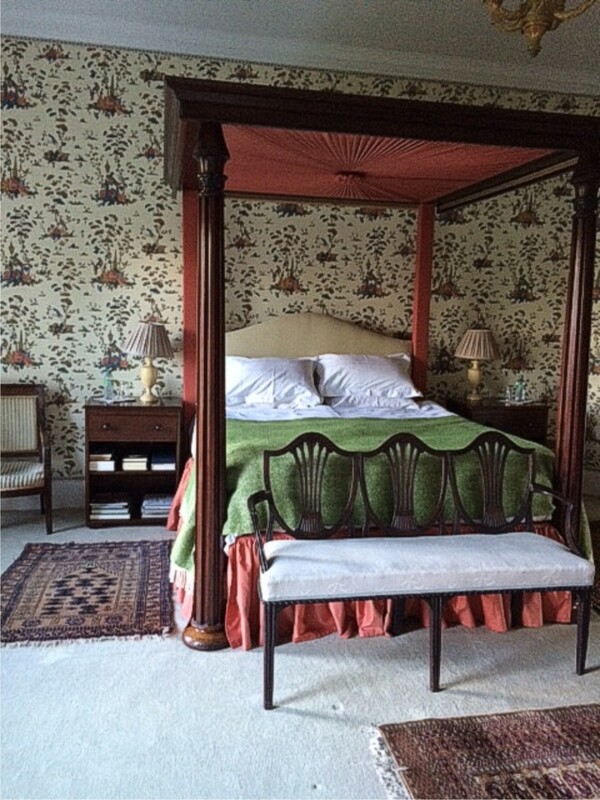 Smith may be a candidate for authorship of what is surely the most extraordinary wallpaper printed in Ireland in the eighteenth century – the richly coloured pattern of trees, birds, fruit and ruins found in Belvedere, County Westmeath. 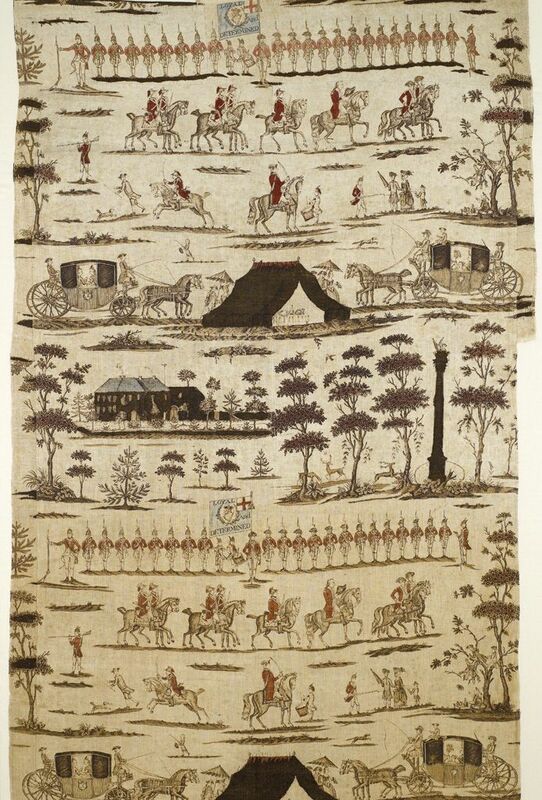 This pattern – most unusually for a wallpaper – contains the name of its maker within the design, and this is -of course – SMITH. 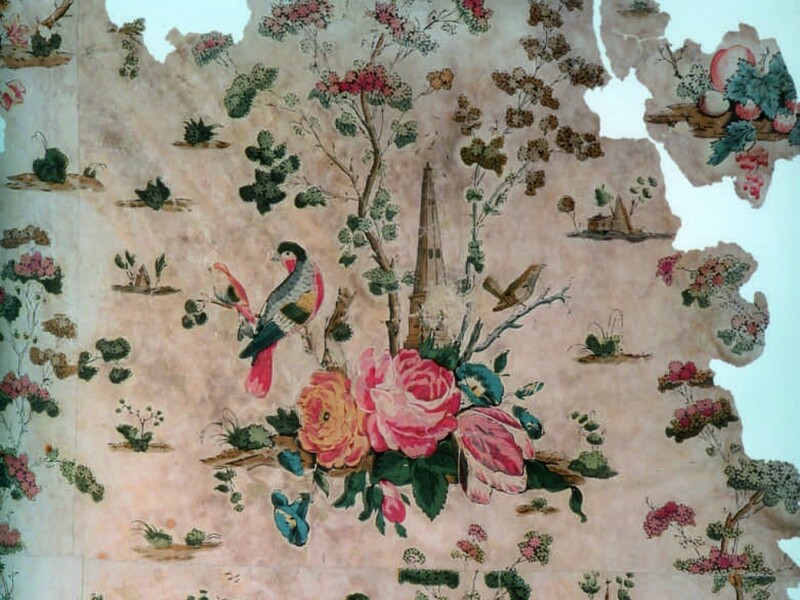 The name is a common one, and is found among Irish paper-stainers of the period, so why should a calico printer be considered as the maker of a wallpaper? One reason is that both the style of the pattern and the technique used to print the Belvedere paper have little to do with paper-staining and everything to do with calico printing. Paper-stainers used dense, opaque colours which lie heavily on top of each other like layers of coloured icing, while calico printers were skilled in the use of dyes and mordants to produce secondary shades by combining and overlaying different colours. This is similar to the method used to produce the extraordinary colour range in the Belvedere pattern – sixteen different shades can be identified, produced from a palette of eleven basic colours. 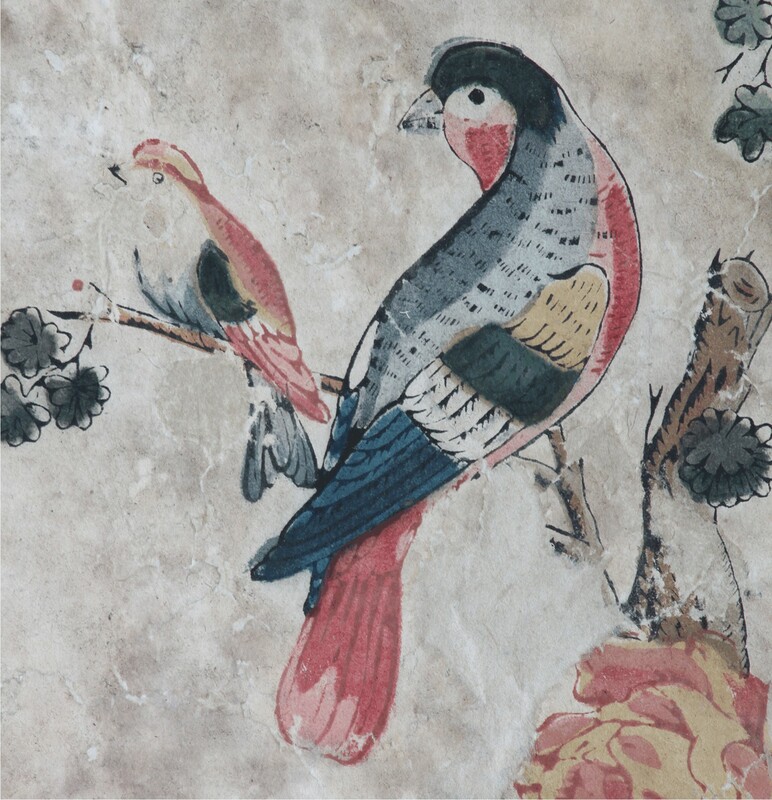 The choice of pigments, too, is unusual for wallpaper – one of the yellows, for example, has been analysed and shown to be an organic pigment, (perhaps the ‘yellow berry wash’ produced from the buckthorn plant and mentioned in eighteenth-century sources), whereas paper-stainers might be expected to have used the mineral pigment ochre. 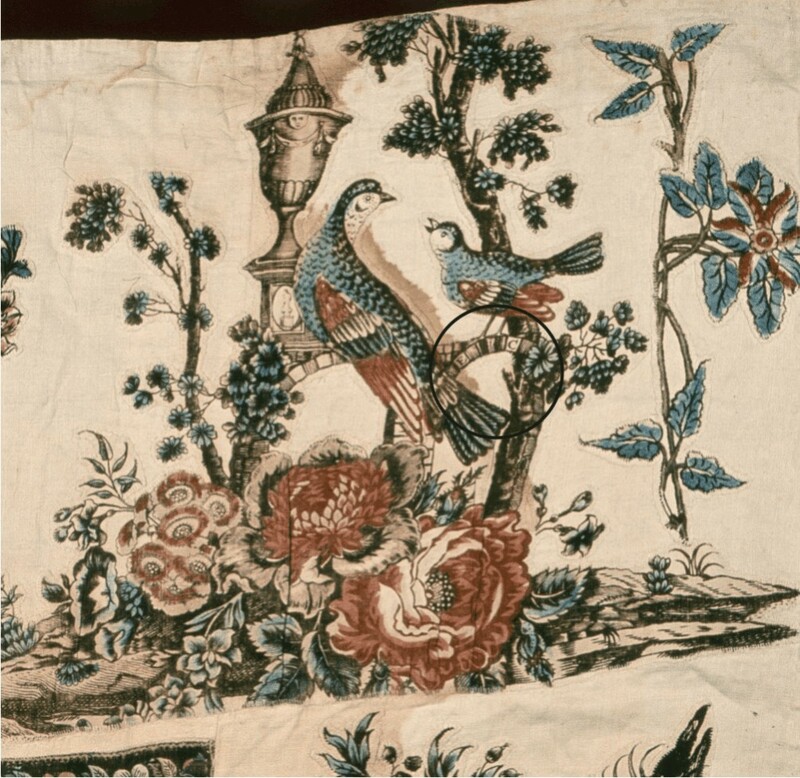 One of the few known facts of James Smith’s career before 1798 is his association with the Palmerstown calico printer Edward Clarke, who – it has recently emerged – produced his own version of the Belvedere pattern. 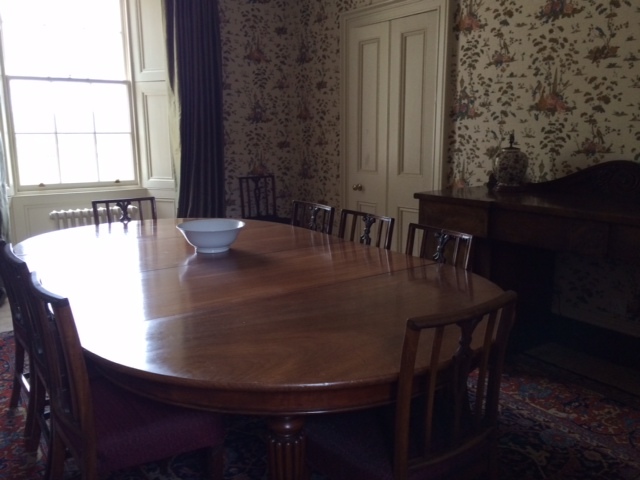 Clarke is best known for having distributed (and perhaps commissioned) that most iconic of Irish textiles, the Volunteer furniture, printed in Leixlip by Thomas Harpur and put on sale in 1783. James Smith seems to have lived with and worked with Clarke as an apprentice, before setting up on his own in Leixlip – possibly taking over Harpur’s lease of the Ryevale calico works on the latter’s bankruptcy in 1786. Like Harpur, Smith appears not to have advertised his products, perhaps because – like his predecessor – he worked to commission for more established merchants such as Clarke, who had a shop in the city in Werburgh Street. Following Smith’s arrest and imprisonment in Kilmainham in 1798, Clarke wrote a character reference in his favour. This was couched in somewhat ambivalent terms – understandably enough, given Clarke’s position as a leading manufacturer and magistrate, he could not be seen to endorse Smith’s actions, or even admit to a close connection. Nevertheless, Clarke played down Smith’s involvement in the rebellion, pointing out that Smith had refused to take any rank in the rebel army, and had surrendered himself as soon as it was safe to do so. The authorities remained unconvinced, however, believing Smith to have played a very active role and taken part in several battles. Smith was one of the last of the state prisoners to be released in 1802 under sentence of banishment. Shortly after his release, an item in the Ladies Magazine referred to one of the state prisoners as being ‘an artist of great eminence… formerly in the employment of Edward Clarke of Palmerstown.’ This surely refers to James Smith. The connection between the ‘Belvedere’ pattern, Smith and Clarke is strengthened by the existence of fragments of calico printed with a version of the Belvedere design, with the name SMITH removed and the initials EC inserted – almost certainly identifying Clarke as the printer. These fragments, arranged among pieces cut from the Volunteer furniture and other patterns, form part of an early nineteenth-century appliqué bedcover, now in the National Museum of Ireland. Compared with the Belvedere wallpaper, Clarke’s rendition of the design is greatly simplified in its range of colours, employing only blue and two shades of madder pink. How do the two versions relate to each other, and which might have been printed first? 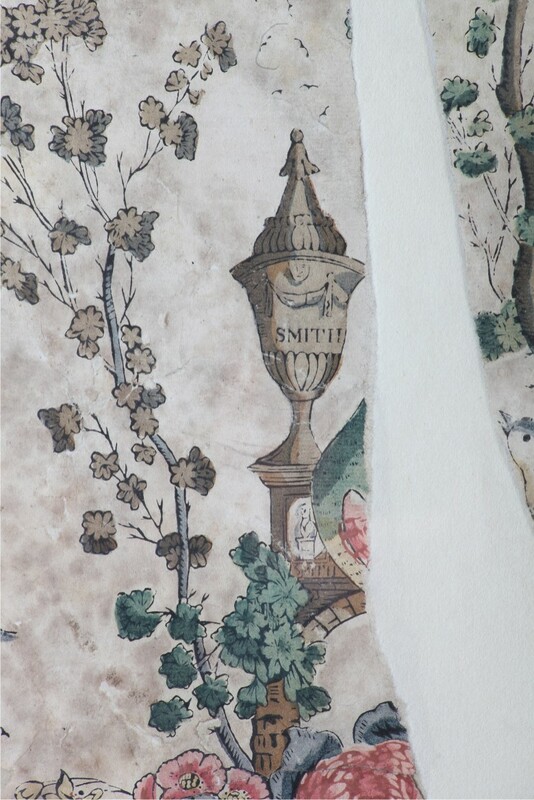 If we assume that James Smith was the author of the Belvedere wallpaper (and this is still only an assumption), then it is likely that Clarke’s relatively lacklustre version of the Belvedere pattern was ‘borrowed’ after Smith’s arrest, imprisonment and banishment, and that the determinedly loyalist Clarke felt quite justified in inserting his own initials in place of his former apprentice’s name. Smith never resumed his printing career in Ireland, and would not have been in a position to object to piracy of this kind. Under the terms of his release he left Ireland and went first, briefly, to London. From there he travelled to Rouen, where a number of other United Irishmen had settled, including William Putnam McCabe, the son of a Belfast Presbyterian cotton manufacturer, who had narrowly escaped arrest at the scene of the capture of Lord Edward Fitzgerald. McCabe had bought or leased a calico mill in Rouen, bringing Irish workers from Manchester as well as employing former United Irish comrades. Smith’s skills would have been a great asset to this venture, but his stay in France was not to be long, however, as he was one of those who returned secretly to Ireland in the spring of 1803 to prepare the ground for Robert Emmett’s planned attempt to seize Dublin. Smith did not take part in the brief and confused fighting around Thomas Street on the evening of July 23rd, having left the city in the morning for Antrim in the company of Thomas Russell, intending to rally support for the rebellion in Ulster. He would therefore have been unaware of the role played in the drama by his former employer, Edward Clarke, who was intercepted by a party of rebels on Aran Quay, shot and wounded, while returning to Palmerstown after attempting to warn the Castle authorities that the rebellion was underway. Large numbers of Clarke’s workers turned out for Emmett, and three were later hanged in Palmerstown for their part in the attack on their employer. Of the remainder of Smith’s life little is known. He evaded capture in 1803, and may possibly have continued to live quietly in Ireland without attracting the attention of the authorities. Almost nothing is known of his early career as a calico printer in Leixlip before 1798. Were the ‘eminent artist’, the United Irishman and the printer who put his name to a masterful piece of work one and the same? Perhaps so, in which case it is remarkable that such a distinctive and inventive pattern should have been produced under the same roof as Harpur’s Volunteer furniture. 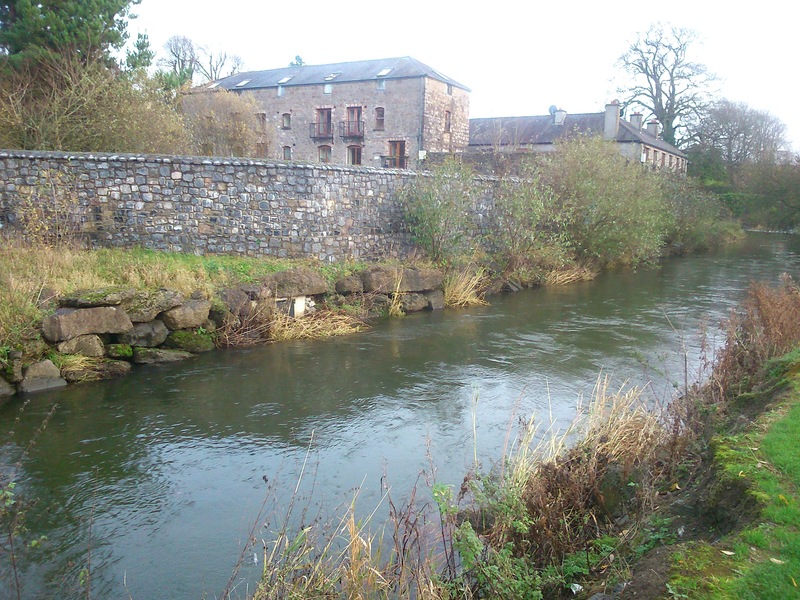 Before Harpur’s tenancy, the Leixlip mill was briefly operated by Samuel Dixon, who left some tantalising descriptions of his linen and cotton patterns but, alas, no surviving examples. Echoes of Dixon’s well-known bird and flower prints on embossed paper can be seen in the Belvedere pattern, while the trees which frame its more elaborate motifs resemble closely those in the Volunteer furniture. Is it fanciful to see a continuity of native genius in pattern design at the Leixlip print works – over the course of several bankruptcies and changes of ownership – in a trade dominated by copies and adaptations of London goods? ‘Belvedere’ is available either as a hand screen print on archival paper or – more economically – as a digital print. Apologies for the very late reply to your question – I have only just realised that there are some responses to these blog posts, as for some reason I am not notified when they are made! I’m afraid I can’t help you – I haven’t come across any Waterstones in connection with cotton and Leixlip, but will keep my eye open. Your Archibald may have set up a yarn spinning mill rather than a print works, which Ryevale was. There is a lot of Leixlip local history online, largely through the efforts of John Colgan, but you have probably come across this already. I too went through the Registry of Deeds searching for Smith, but drew a blank. Good to hear from you! I’d be delighted if any of this was of wider interest, and please copy me in to what you produce. Since writing this post I did some delving in the Registry of Deeds hoping to find a mention of Smith in connection with Ryevale Mill, but without success. So I am not sure if he was ever actually the tenant – but he was certainly known as James Smith of Leixlip. Hi David. It would be no harm to contact local historian John Colgan on the subject if you haven’t already done so. Get in touch with me directly if you need his details. Thanks.